UNO's College of Public Affairs and Community Service is home to a nationally-ranked Master's of Public Administration program. Dozens of current city administrators across the state are alumni of the program. The following story appeared in the most recent issue of the UNO Magazine, which highlighted many of the ways UNO touches all part of the state of Nebraska. Read the magazine online as a Flipbook or download a PDF. On a clear day, Jeff Sprock can see Laramie Peak from the golf course in Mitchell, Nebraska. 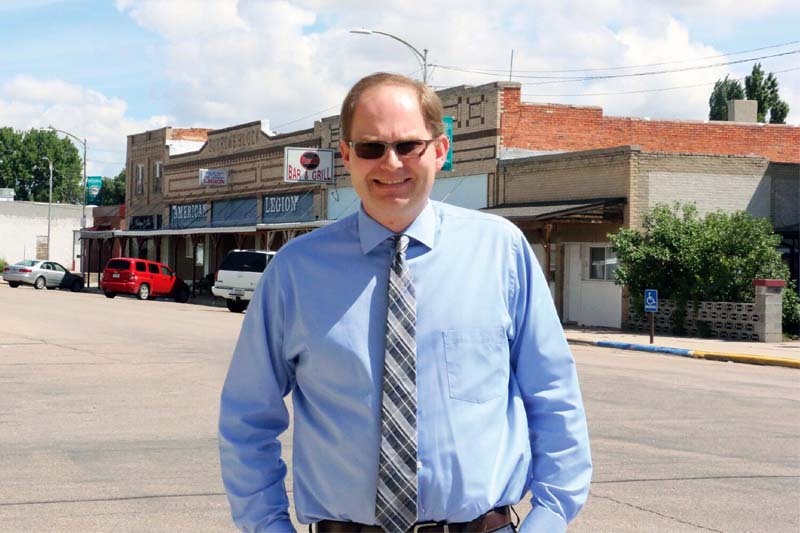 Sprock was hired to serve as city administrator in Mitchell, a community so far west that he could throw a rock in Nebraska and it might land in Wyoming. Omaha … isn’t so close. But Nebraska’s biggest city looms just as large as the 10,000-foot mountain towering in the other direction. That’s because Sprock, since 2012, has taken online classes to get his Master of Public Administration (MPA) degree at UNO. pursuing an MPA degree at UNO entirely through online coursework. He has taken courses towards his degree since 2012. UNO’s reach extends far across Nebraska through its MPA program. From Omaha’s suburbs to distant communities in the state’s panhandle, MPA graduates bring professional management to city government across the state. UNO’s MPA graduates work as city managers or city administrators in at least 16 communities in Nebraska. That’s nearly a third of the estimated 50 Nebraska communities that employ a city manager or administrator. Another 20 of UNO’s MPA graduates have municipal jobs in other states, including 10 in Iowa. 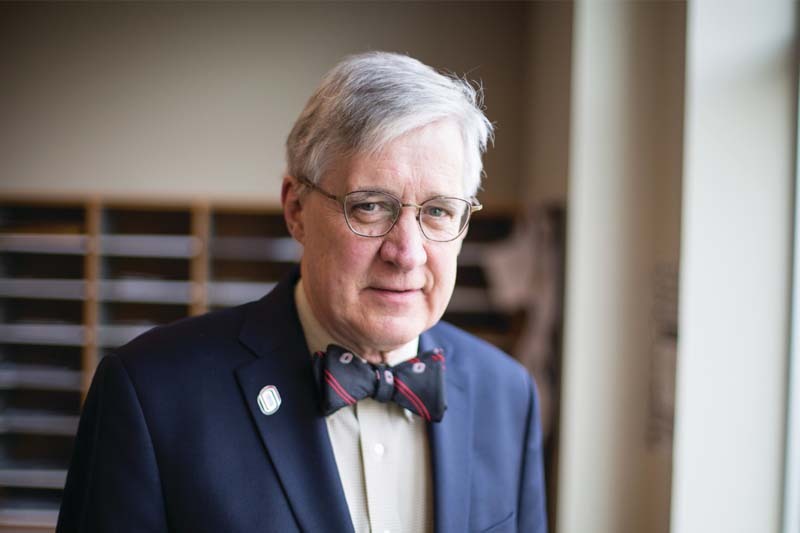 These graduates don’t always grab headlines, but they make an impact in rural communities, says Robert Blair, professor of public administration and director of UNO’s Urban Studies Program. The program often attracts mid-career professionals looking to make a career change or upgrade. About 200 active students are in the program, with some finishing in two years and others taking longer as they balance career, family and educational obligations. Craig Maher, a professor and director of UNO’s School of Public Administration, says most students have one thing in common. 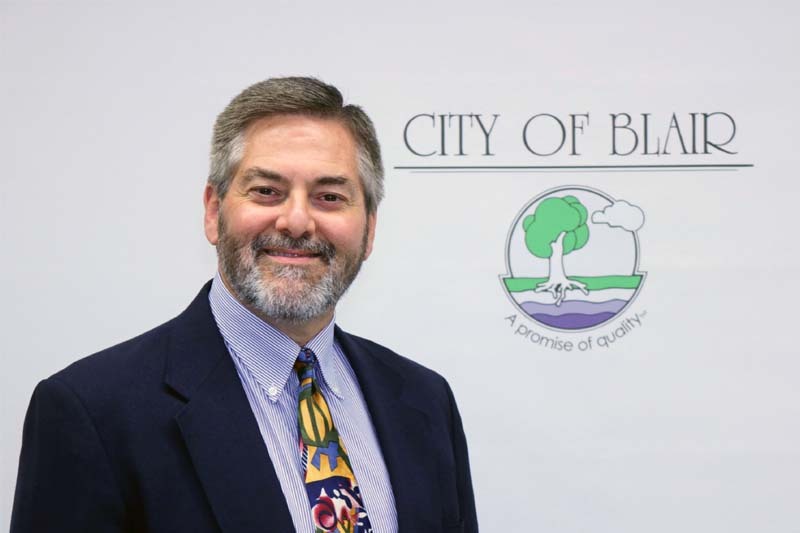 Phil Green is the assistant city administrator for Blair, Neb. He earned his MPA from UNO after previously spending time in the ministry. The MPA program includes coursework in budgeting, finance, public policy and human resources. It sounds like the outline for an MBA program, but the MPA student puts those skills to work in a government or nonprofit setting rather than the corporate world. Maher says a growing number of students are interested in careers with nonprofit organizations, but many MPA graduates still take roles in municipal leadership. Some MPA graduates, like Bellevue City Administrator Joe Mangiamelli, served in the nation’s armed forces before turning to government work. Mangiamelli was drafted in 1967 and served in Vietnam. He received his MPA from UNO in 1991. Over the years, Mangiamelli rose through the administrative ranks of Omaha’s municipal government and also took a position as city administrator in Columbus. He described a sense of pride in bringing tangible improvements, like a new fire station or library, to a city’s residents. “All these projects are very exciting,” he says. Phil Green, assistant city administrator in Blair, was involved in ministry before getting his MPA from UNO. He and other MPA graduates don’t share the skepticism about government that often bubbles to the surface in today’s political environment. UNO’s program remains popular for multiple reasons. U.S. News and World Report ranks UNO’s MPA program 25th best in the nation. The program scores as high as sixth in the teaching of public budgeting and finance. UNO offers the only accredited MPA program in Nebraska or Iowa, making it a popular choice for aspiring city managers throughout the region. About 60 percent of UNO’s MPA graduates come from the Omaha area. Other benefits of the MPA program are harder to quantify, but just as meaningful for those who earn the degree. 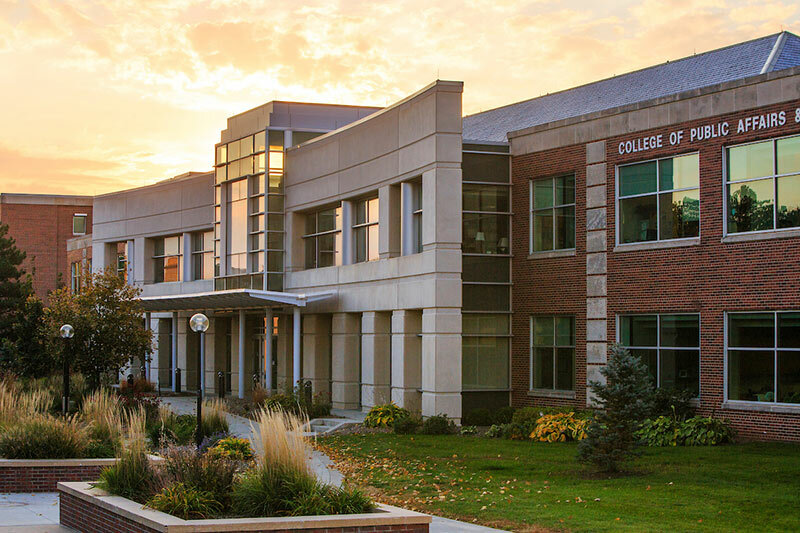 Faculty members make an effort to get out of the classroom and provide professional development through organizations like the Nebraska City/County Management Association. Blair even went to Norway as part of UNO’s sister university relationship with Adger University. He found that Norway’s city managers are able to work with a large city council, some with 30 members. Chris Anderson, city administrator of Central City near Grand Island, says contact with faculty remains a benefit of the program long after coursework is completed. He received an MPA from UNO after getting his bachelor’s degree in political science at UNL. “It’s not like you graduate and they send you off and you never hear from them again,” he says. Anderson believes it’s important to tap into the expertise of both faculty and active city managers because the job demands such a broad range of knowledge. At one point, Anderson was named a vice president of the International City/County Management Association. At the time, the president of that organization was from Montreal. “In many professions, one of the most important elements is networking and being involved in a number of different organizations,” Anderson says. Current MPA students also benefit from a scholarship program awarded through the University of Nebraska Foundation. The Nebraska City/County Management Association puts money into the fund, which pays around $1,500 for two or three students a year. Blair received the scholarship when he was a student. More recently, Sprock found that the scholarship boosted his goal of using the MPA to improve his community. City managers and administrators face challenges, some of which don’t get covered in the MPA program. Blair says UNO’s faculty teaches technical skills — things like management, budgeting and finance. These are essential to running a complex municipal government. That’s only part of the job. The rest, sometimes, comes through experience. Green says UNO prepared him for the job, but the program can’t teach everything. The position is so diverse, with administrators overseeing everything from economic development and labor relations to public works and utilities infrastructure. Many city managers and administrators say the job requires thick skin, especially in a smaller community when unpopular decisions are made, or at least recommended to the city council. Green, however, says he wouldn’t give it up for anything. He says he’s always had a fascination with cities and looks forward to helping Blair deal with its pressing issues, such as finding affordable housing and developing a use for the former Dana College campus. “When I have a chance to visit really big cities, you see all of the cars and all of the buzz,” he says. “It’s amazing to think that we are all individuals and yet we all live in this beehive of activity. “It is our task to have the infrastructure in place for people to pursue their desires, passions and goals,” he says. Anderson says UNO’s MPA programs is essential to helping local government meet the needs of citizens in cities and towns across the state.